Adolfo Mexiac was born August 7, 1927 in Esperanza Michoacan. He lives in Cuernavaca, Mexico. He studied art at the Michocan’ Academy of Art between 1944 to 1946; and in the San Carlos Academy, in Mexico City from 1947 to 1956. He was a memeber of TGP from 1950 to 1959. In the year of 1955 he was reponsible for TGP finances, and in 1956 he was in charge of the projects for TGP. 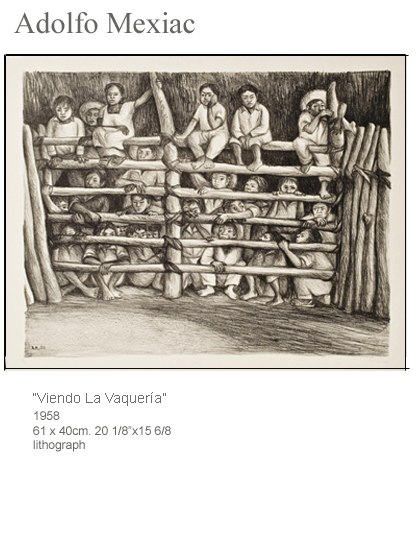 He lived in Chiapas from 1953 to 1954 where he worked on diferent artistic proyects for The Indigenous Institute (Native Mexicans Institute); also in that state he had his first solo exhibition. In 1964 he made two wood cut works on Mahogany tree, 6 square meters size, for the National Anthropological Institute, he also worked on a great number of design of graphic projects for the Workers’ Union magazine “Ceteme”, for text books, and for the journal publication of the Instituo Nacional Indigenista. Exhibit and new works. It was attended by the Cultural and Art world celebrities from Mexico, and delegations from the United States.